Thanks to Sebastien and Quai Lab who’s been working on it very hard! And still debugging some things! These muscles have no good control technology yet. It is difficult to organize the rapid heating and cooling. What characteristics of muscles were in your tests : resistance and the material of the wire, the voltage for muscle contraction, and what electronics did you use for that? Its been at least a year, I did these tests. The polymere wire was 0,8mm. The electric wire resistance was Nickel Chrome 0,3mm. I would vary the temperature of the resistance using a 220v light shader directly connected to the resistance. (dangerous tests…) So I haven’t calculated what Amps was drawn by the resistance. One polymer artificial muscle can pick up 200g load with contraction 1 cm. 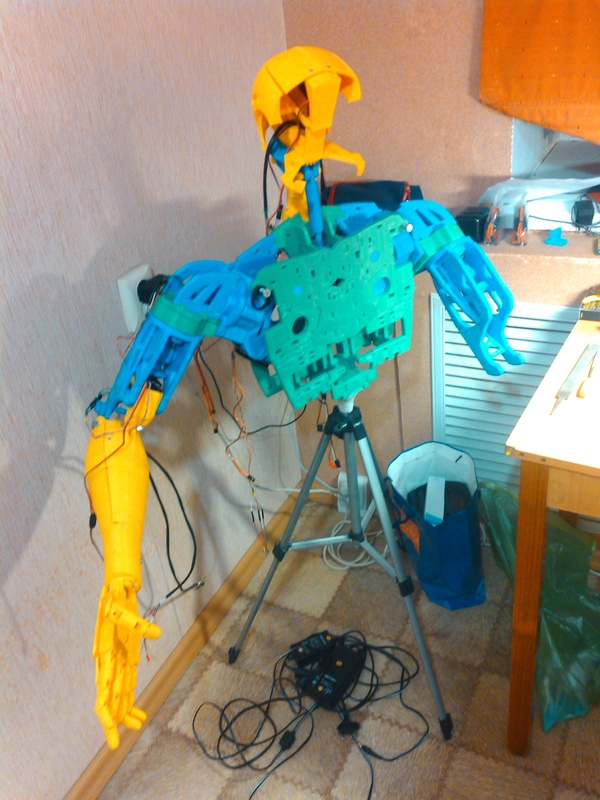 My experiments with polymer artificial muscles: the movement of the InMoov robot finger. Cool that you are experimenting this also!! I’m glad to see some other tests. With the few tests I did with polymer muscles, I was a bit disapointed about the speed, and precision. Also as results due to the wire temperature, the polymer was getting less and less responsive and brownish. Oh Okay, I got it. We are not using Myrobotlab for various reasons. All software is written by us. When we finish, we plan to put it into Open source. I see, is it also Python written? Interesting design. Do you think the robot will be able to walk? 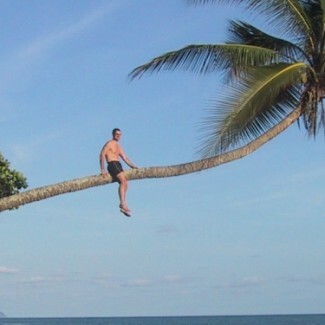 I think it is still possible to attach a tail for stability. The first tests of the network protocol “Network – RaspberyPi – Arduinos” with Russian voice. The protocol supports multiple Arduinos connected to RaspberyPi. Nice! Are you using MyrobotLab for the Arduino control with the Raspberi pi? Nice work, Alex! Could it walk? Ah yes I had seen your post, but I couldn’t find in which topic it was posted. It is a good idea of course, as a temporary feature. I was thinking of using an assisting walker for the beginning. And then when we figure a better way for the robot to walk, we could remove it. Gael, what about anthropomorphic legs? What if to attach the tail with the wheels to the back the of the robot. The tail will confer resistance. The wheels can spin in one direction only. Interesting solution. Have you tried to take by two fingers some things? yeah that is likely possible! The big servos did\’nt fit. They are a little bit smaller then yours. By the way russian federal television had shows your and my robots 🙂 again (unfortunately this site does not allow post links). Ip cameras \”dahua\” mounted in the eyes. I\’m connecting to them using my software, which allows everybody to connect to a wide range of ip cameras. I plan to use them with my pattern recognition algorithms. The big screen in the background is nice for to work. Are you using MyRobotLab to do the visual tracking? Ip cameras “dahua” mounted in the eyes. I’m connecting to them using my software, which allows everybody to connect to a wide range of ip cameras. I plan to use them with my pattern recognition algorithms. Did both servos fit without modifications? Some builders are having trouble ordering my recommended servos. The big servos did’nt fit. They are a little bit smaller then yours. Thank You Gael. 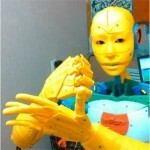 I did not even have time to follow the innovations in the project InMoov! I hope we too will make a useful contribution. 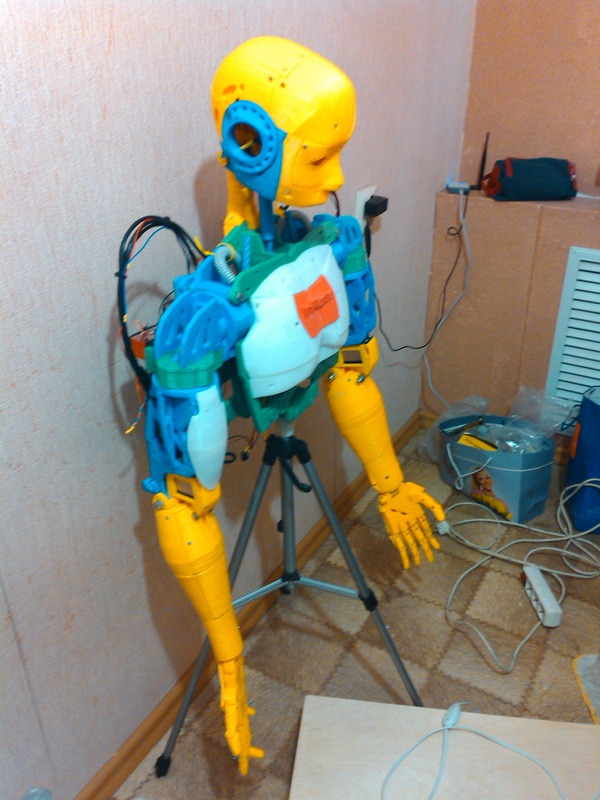 Russian Far East News talked about the robot InMoov and Gael Langevin. Thanks for the link to the article. 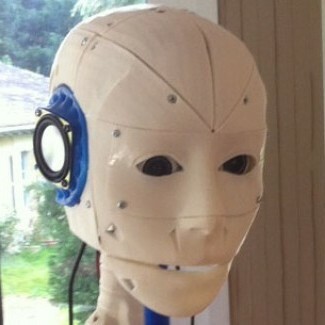 You do have a nice color mixture on your InMoov. Interesting color combination. Did you come to the Geek PIcnic? Have we meet? In this experiment, I used the Jhack\’s approach for implementing feelings. 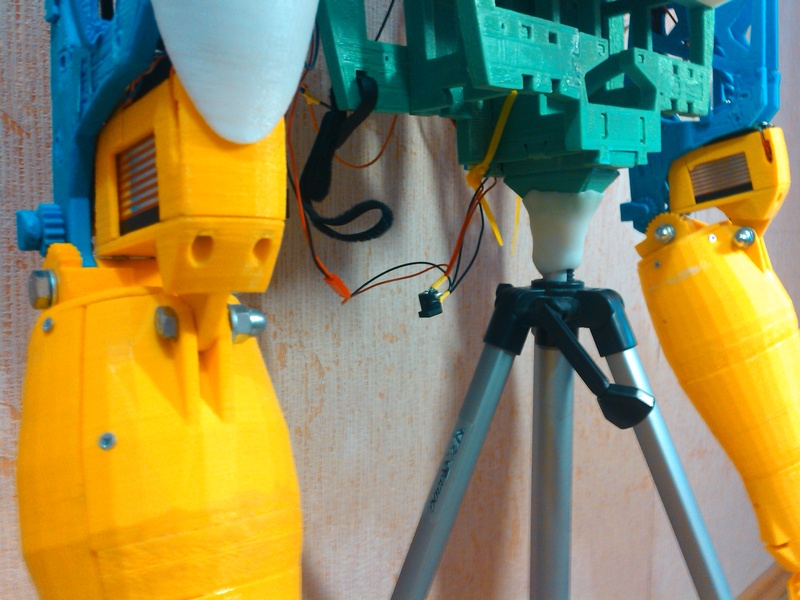 However, the using of springs and 90 degrees servos reduced range of fingers motion. Then I used the blocks to increase the stroke finger tendons. Interesting way of hooking up the tendons to the servo horns. Is it to make it easier for adjusting? In this experiment, I used the Jhack’s approach for implementing feelings. 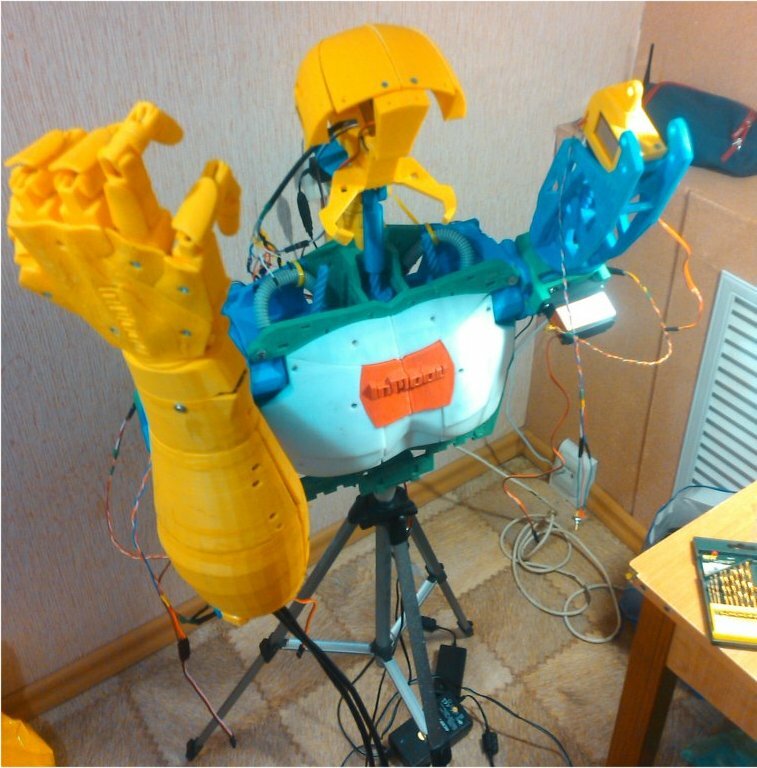 However, the using of springs and 90 degrees servos reduced range of fingers motion. Then I used the blocks to increase the stroke finger tendons.